Please ... come with me to enjoy the witness of my open loving soul. My life, my love, and my breath are the work of Spirit. Watch it. Witness that development as I take you through my life as I came to apprehend the beauty that I am to the world. This is personal. This is me growing. This is me loving my life. Through my understanding of my "I", God's gift of my spirit and soul, I'll share the "am". My "I am". When I work, I am openly meditating on the inner essence, the light, that makes me love. And I love the world for it is God. Watch as I shed frustrations, doubts, embrace Gratitude, grow, share and ... surrender to the power and presence of Spirit within. 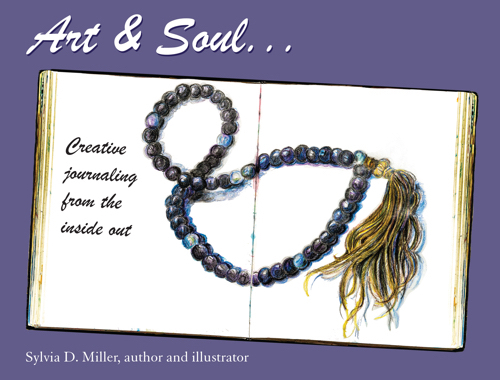 I open the pages of my sketchbooks and journals to share them with you. I love. I will bare for you my heart and soul ... from the inside out. Cost: $24.00 + $6.00 shipping & handling. Send your check made out to Sylvia Miller, 1638 Pine St., Lake Oswego, OR 97034. Please indicate the number of books you wish to order.